Everyone knows the story of how Moses was sent by God to set the Israelites free from the Egyptians; How he confronted Pharaoh and was used by God to bring about the ten plagues and how he eventually lead God’s people through the Red Sea and towards freedom from the their captivity. We also know that Moses didn’t want to go. He had fled from Egypt and settled in Midian, married, had a son and was living the quiet life of a shepherd. 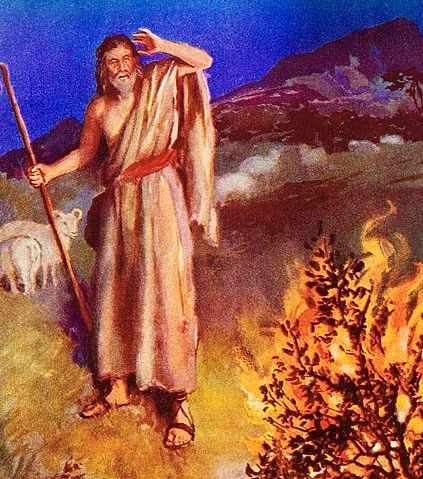 Some time ago I heard a sermon about Moses’ journey from the burning bush to the Exodus. Rather than focussing on the extraordinary miracle of the plagues, it looked instead at how God did a work in Moses to build him up from someone who was scared of his own shadow to a fearless man of God. In Exodus, when God called him, he responded with ‘send someone else’, and came up with a list of reasons why it was a bad idea. Not surprisingly God didn’t let him get away with it. At the start God allowed Aaron to take the lead in confronting Pharaoh, but over the course of time, this was replaced by Moses being God’s mouth-piece as we can see from these scriptures. Ex 8:20 Then the Lord said to Moses, “Get up early in the morning and confront Pharaoh as he goes to the river and say to him, ‘This is what the Lord says: Let my people go, so that they may worship me. Ex 9: 8 Then the Lord said to Moses and Aaron, “Take handfuls of soot from a furnace and have Moses toss it into the air in the presence of Pharaoh. Finally – when Moses proclaimed the last plague – the death of the first-born, we can see that his attitude had changed completely. Exodus 11: 4-8 So Moses said, “This is what the Lord says: ‘About midnight I will go throughout Egypt. Every firstborn son in Egypt will die … There will be loud wailing throughout Egypt … But among the Israelites not a dog will bark at any person or animal.’… All your officials will come to me, bowing down before me and saying, ‘Go, you and all the people who follow you!’ After that I will leave.” Then Moses, hot with anger, left Pharaoh. Was this really the same fearful man who had run and hidden in the land of Midian for forty years and had begged God not to send him? Moses needed to go through God’s training process so that he would be the man who became the great leader of his people that everyone knows. When God takes us through seemingly impossible things, He is training us. This involves slowly exposing us to more and more difficult things to strengthen us bit by bit. Don’t run from this process, he’s preparing us for something much greater than we can imagine and He knows what He’s doing. Let God remove your training wheels.